In today's world of grab-and-go foods, breakfast in bed seems almost quaint, like the old rotary phones that take a few extra seconds to dial.<br><br> It's all about time.<br><br> Monday is Valentine's Day, and what better way to show your love than with the gift of time? Back away from the Pop-Tarts and pick up the saute pan. Breakfast in bed is all about taking the time to do breakfast right. In today’s world of grab-and-go foods, breakfast in bed seems almost quaint, like the old rotary phones that take a few extra seconds to dial. Dana Moos’ Chocolate Ricotta Pancakes in a family-friendly version with chocolate sauce, raspberry coulis and whipped cream. Dana Moos Chocolate Ricotta Pancakes are the little black dress of breakfast foods. They can be dressed up into an adult version with Grand Marnier syrup. Ricotta, Parmesan and Asparagus Crepes topped with Maine Crab and Sherry Butter. 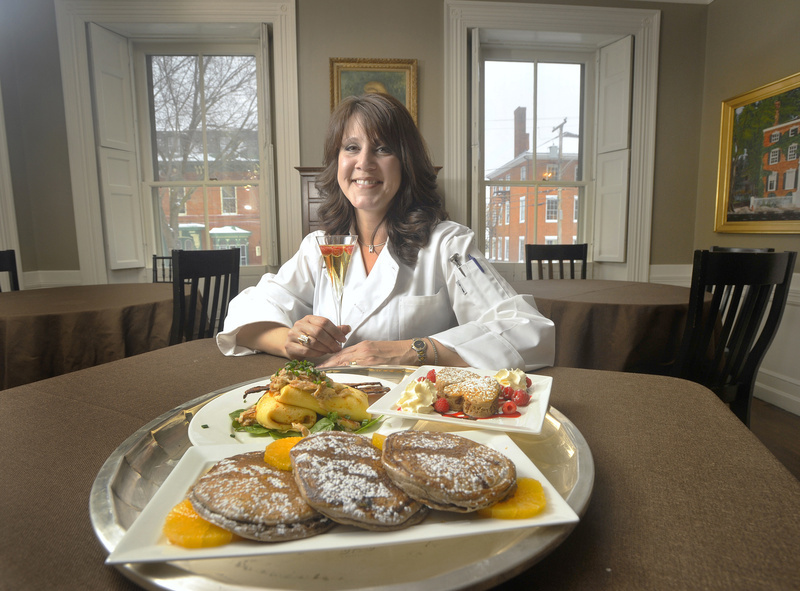 The recipe is included in Dana Moos' new cookbook, "The Art of Breakfast: How to Bring B&B Entertaining Home," due out in June. Dana Moos whips up a batch of her Chocolate Ricotta Pancakes. "It's not really a very sweet batter, because there's not much sugar," Moos said. "And the cocoa itself, of course, has no sugar, so adding a few mini chocolate chips is actually pretty good." Dana Moos’ Chocolate Ricotta Pancakes with chocolate sauce, raspberry coulis and whipped cream. Monday is Valentine’s Day, and what better way to show your love than with the gift of time? Back away from the Pop-Tarts and pick up the saute pan. Breakfast in bed is all about taking the time to do breakfast right. It’s about spouses spending a leisurely morning together over a lovingly created special menu instead of inhaling microwaved foods as they run out the door. It’s about kids doing something special with their parents and actually communicating with each other face to face instead of sending a text message. But in this era of instant gratification, does anyone even know how to do breakfast in bed anymore? 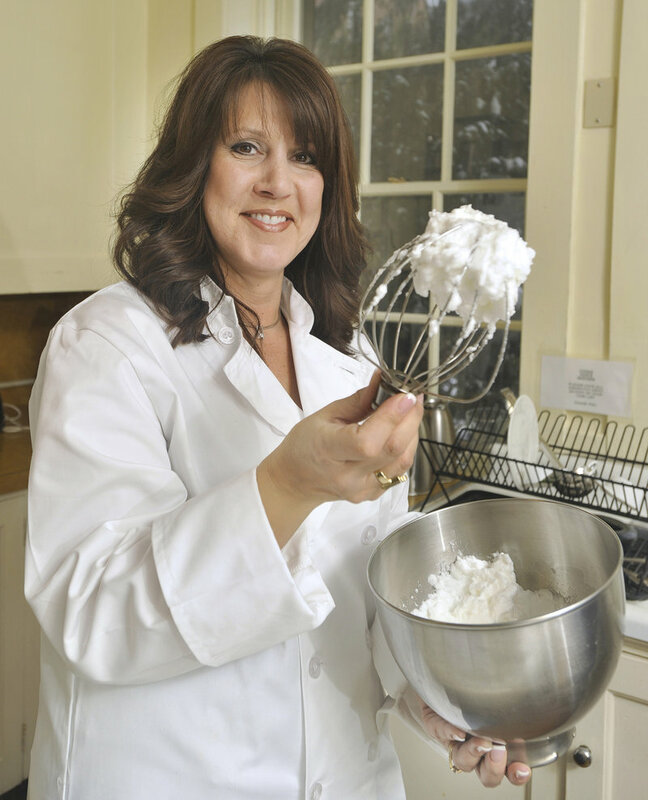 Dana Moos, a food blogger and former innkeeper who has written a new cookbook, “The Art of Breakfast: How to Bring B&B Entertaining Home” (Down East, $28.95), thinks Americans have lost touch with the first meal of the day. 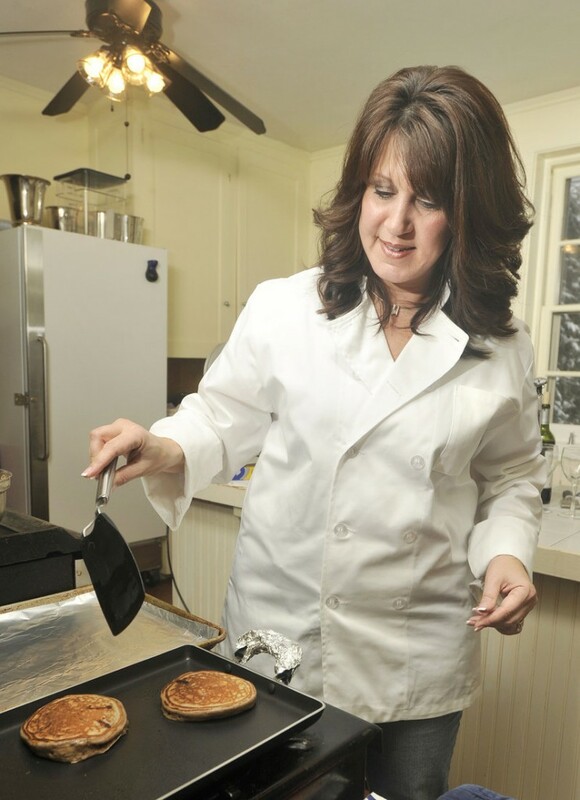 Moos, now a lodging broker based in Bar Harbor, learned how to make great breakfasts when she and her husband owned the Kingsleigh Inn in Southwest Harbor. She found she never had the time to serve her guests the amazing breakfasts she really wanted to, so she developed her own recipes where she could do most of the prep work the night before. She learned how to take simple food and make it a little more sophisticated just by using fresh vegetables and unique combinations of ingredients. We met Moos in the kitchen of the Danforth Inn on Portland’s West End to get some ideas for a Valentine’s Day breakfast in bed that won’t take hours to prepare but will still impress your sweetie. All of these recipes are in her new book, which will be published in June and is available for pre-order on Amazon.com. 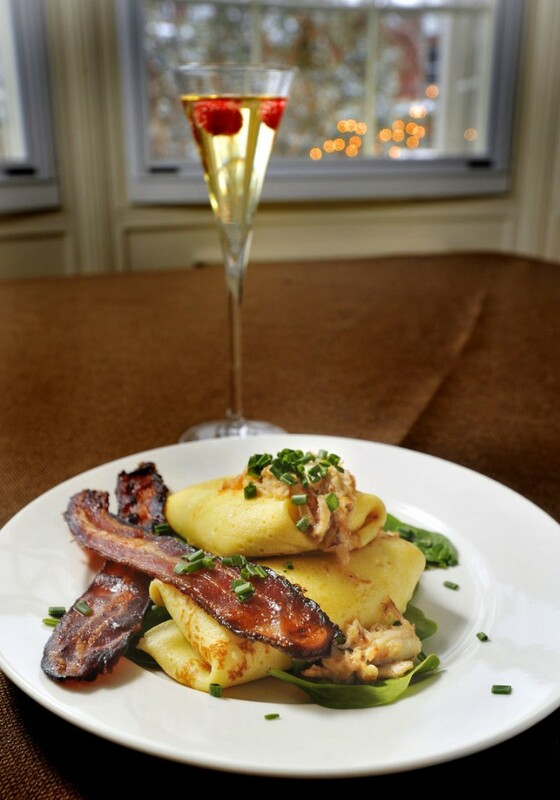 We started with a savory dish: Ricotta, Parmesan and Asparagus Crepes topped with Maine Crab and Sherry Butter. 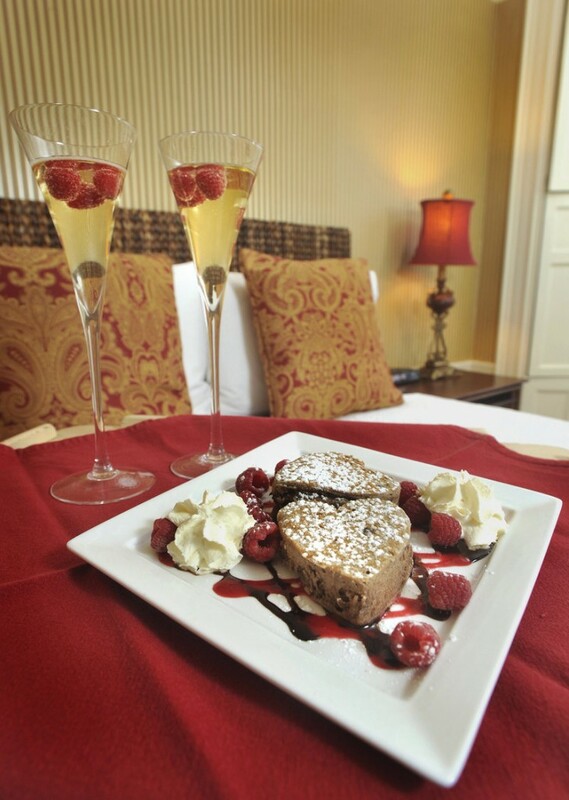 Crepes scream Valentine’s Day, and the crepes used in this dish can be made well ahead. Moos mixes her crepe batter in a blender. The batter should be brought to room temperature before cooking. You don’t need a special crepe pan; any 8- or 9-inch nonstick frying pan will do. If you don’t like asparagus, you can use other vegetables – zucchini, Vidalia onions – but cook off some of the moisture first so you don’t end up with messy crepes. When the crepes came out of the oven, Moos plated them on a bed of greens, then added crab and sherry butter, a little black pepper and chives. To go with the crepes, Moos made a batch of candied peppered bacon. This is so easy that children could do it, and the bacon dresses up any breakfast plate. Let your kids scramble some eggs or make some waffles instead of doing crepes, add this bacon, and mom (or whoever is being served breakfast) will still feel like royalty. You need thick-cut bacon, preferably something like the alderwood-smoked bacon that Moos got from the butcher counter. Place the sliced bacon on a sheet pan lined with non-stick foil. Then sprinkle cracked black pepper and some light brown sugar on each piece before putting it in a 350-degree oven. Bake it for about 30 minutes, until it’s brown and crispy. Moos’ Chocolate Ricotta Pancakes are the little black dress of breakfast foods. They can be dressed up into an adult version with Grand Marnier syrup or dressed down into a fun project for the kids. If chocolate pancakes don’t sound appetizing, try a “winter spice” version. Instead of cocoa, use cinnamon, nutmeg and cloves, and drizzle with regular maple syrup. 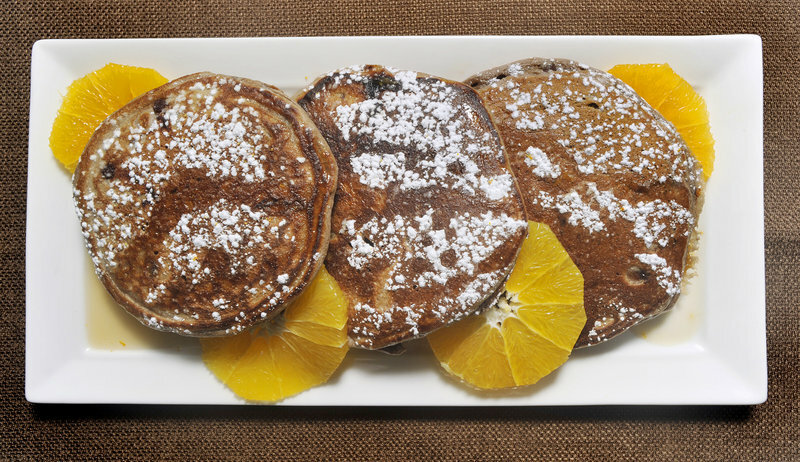 When Moos plated the Chocolate Ricotta Pancakes, she grated a little orange zest over the top. themselves, the chocolate pancakes might be a little bland. But that extra touch of orange zest, along with the orange juice-and-Grand Marnier flavored syrup, really made the dish come alive and even feel a bit decadent – just the note you’re looking for on Valentine’s Day. 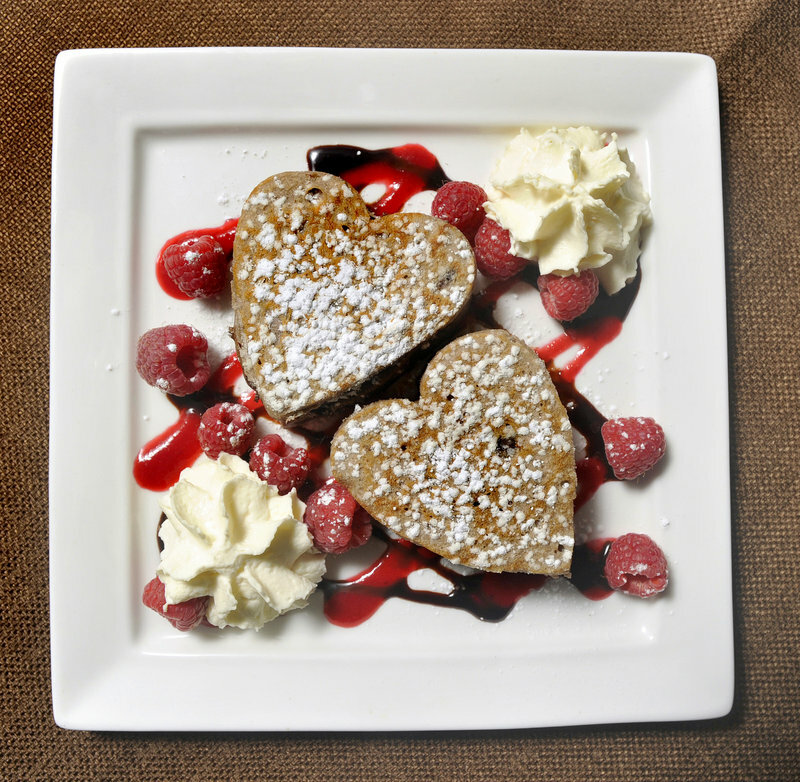 To serve her heart-shaped pancakes, Moos swirled the plate with some store-bought sundae topping and a little raspberry coulis she made by throwing some raspberries into a blender along with some powdered sugar and a squeeze of lemon. The coulis should be strained after it’s pureed. Any flavor of sundae topping will do, and you can let the children go crazy with their squiggles. “You can see why kids would love this,” Moos said. Top it off with regular maple syrup and add raspberries, a dusting of powdered sugar and whipped cream. You’ll need something to drink with this special breakfast-in-bed menu, and Moos suggests a glass of champagne for the adults with a little dash of St. Germain, an elderflower liqueur that adds just a touch of sweetness. Throw in a few raspberries or pomegranate seeds, and the splash of red makes it a perfect drink for Valentine’s Day. All that’s left is the presentation. A little soft lighting and some music, maybe? We suggest the Dusty Springfield version of “Breakfast in Bed” (www.bit.ly/eeOZXS).